April 27 2008:	Last	Thursday,	several European media representatives spent a day with the America's Cup defender, Alinghi. Communications Director, Paco Latorre, explained what the day was about. "What we want to share with you today is that Alinghi is back to sailing; Alinghi once again has sport at the heart of its activity." "Since we won the 32nd America�s Cup, last July, we didn�t do a very good job of sharing our ideas for the 33rd America�s Cup; now we are trying to do better, to share with everyone what the goals, the ideas for the future are. As you can imagine, during the last few months, most of our attention has been focussed on the GGYC court case that is taking place in New York. Now, what we want to do is to change the focus and get the attention and the interest back on the water as soon as possible; we want this fight to take place on the water." "As we all know, this 33rd America�s Cup is going to be different; different from what we expected, different from what we have experienced in previous editions, but it is going to be very exciting, from the design point of view, the shore point of view. There are going to be plenty of challenges; challenges for the sailing team, challenges for the design team and those are what we want to present to you today." Brad Butterworth, tell us how you feel about it, how you are facing this different challenge? Brad: It’s nine months since Ed and I were sitting here after winning the last Cup, which was such an exciting event here in Valencia and it’s good to see you guys here again. So, how are you preparing for the 33rd America’s Cup? Brad: Well, one thing that’s happened is that we finally have some certainty, a little bit of certainty, that it’s a Deed of Gift match and there is a high possibility that we sail these big multihulls. So, we’re starting to build this boat up in Switzerland, in Villeneuve. The design team’s working hard on it and we’ve been restructuring things within the sailing team. Everybody knows Ed, because he’s the guy that sailed the boat in the last Cup and he’s the best guy at that job, for sure. John Barnitt, who’s sitting beside me, he was a member of Alinghi’s winning team in 2003, in Auckland, and he’s got a great history in the America’s Cup having won it 4 or 5 times (Barnitt interjects 3). OK 3 times, in Fremantle and also on Dennis’ cat, in San Diego. On my left is Alain Gautier and he’s a legend in multihulls; I haven’t had much sailing experience in them, I’ve just read about him and he’s got a huge amount of experience in these boats. So, we’ve been restructuring on the sailing side and we’re looking forward to a big year in sailing different boats, in different regattas. I think we can move on now to John Barnitt. Tell us John, about your feelings in rejoining the team and, especially, in presenting this sailing programme that Alinghi has for 2008. John: I’m very excited to be back on the team, I really enjoyed our 2003 America’s Cup and it’s just great to be back with the guys. Tell us about the programme that has been prepared to get ready for this challenge. John: We do have a pretty extensive programme prepared for 2008. Parts of that programme have the purpose of preparing us for a Deed of Gift match. We’ll be sailing Decision 35 catamarans on Lake Geneva, we will be sailing the Alinghi 41 there and we also have two Volvo Extreme 40s, which you’ve seen on the water here. We’ll be sailing those boats here today and campaigning the white boat in the IShares for this year. Ed will be steering in the IShares this summer, with Rodney Adern, Lorenzo Mazza and Pieter van Neiwenhuyzen, so we are doing all we can to gain valuable multihull experience and we’ll be kicking off the IShares programme with the tune up regatta, in Valencia, on May 16/17/18. In addition, we are really enjoying our co-operation with Alain Gautier and look forward to having some more sessions with him, on Foncia, later in the year. So, we are doing all we can to prepare in a new discipline of sailing and it’s a fascinating and very steep learning curve and we’re pretty excited about it. Now we will go to Ed Baird. Ed, tell us how you feel about being used to the monohulls and now going on to this multihull experience. Ed: I think it’s a very exciting opportunity, because it’s forcing us to go into boats that we haven’t been used to racing over the years. We have these Extreme 40s here and the first time we went out as a team it was beautiful, just like you see now with 5 or 10 knots of wind and we got a little experience and saw how they worked. Then the second day it was 20 to 25 knots and we sort of scratched our heads and said “Eh, maybe we’re not quite ready for this”, but we went out very cautiously and, by the end of the day, it was starting to be something we were beginning to feel quite good about. We’d realised they are boats, sail boats, and we just had to learn about the things that are different from other sail boats and that means a lot of time on the water. So, we then went sailing a tri and that went very well, apart from one 3 minute period that went very badly. You all know about that, we capsized the boat, which is something that can happen with these very powerful pieces of equipment and, unfortunately, we caused some damage. We’re sorry it worked out like that, but it’s one of those things that we’ll learn a tremendous amount from. We’ve already taken lessons from that episode that will help us with the big boats that we’ll be sailing next year. So, the team is committed to learning to sail these boats and, whilst we are disappointed that the competition is in the situation it is, we are taking on our neighbours down the street and we will do our very best to prepare ourselves and become multihull sailors. Now I will ask Alain Gautier to explain his role as consultant to the team and how he sees the first steps of the Alinghi sailors on board these multihulls. My role in the Alinghi team is just to give my experience, from 35 years in multihulls, because this next America’s Cup will be very different from the others and the time is short. The team has to be ready for the big day, with the maximum amount of experience, and I will try to give as much as I can. The other part is to train the people, on Foncia and maybe another boat, for match racing in big multihulls. To Paco Latorre. You mentioned that AC Management & Alinghi have joined forces and become an entity. Could you explain a little more? Well I didn’t say that they had become one entity, just that they have joined forces and that is exactly it. We are working together on one objective, which is to have the best possible 33rd America’s Cup. To Brad Butterworth. 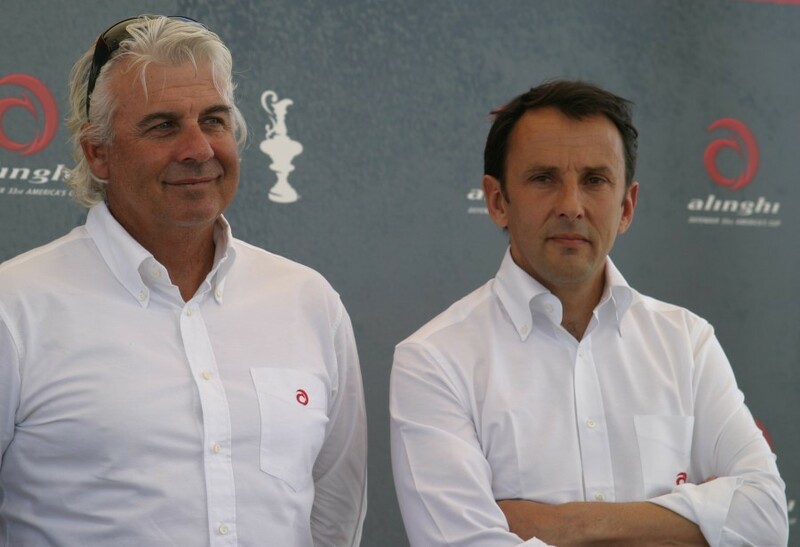 Both teams, Alinghi & Oracle, have hired some consultants, Alan Gautier here and Franck Cammas and some others for Oracle, but it seems the people who will sail the boats won’t have much experience in multihulls. Why did you both decide this? Wouldn’t it have been much easier to hire people from the multihull world, or is it a budget thing that you already have signed contracts with sailors, so you have to use those sailors? Brad: We are hoping to get the guys up to speed on sailing multihulls. The guys that are in this side of the sport are professional sailors; they know how to sail boats and they know how to adapt themselves to different sorts of boats. I think we’ve got a good cross section; we’ve got guys who have sailed multihulls and we’ve brought in people, with years of multihull experience, like Alain and others, but most of the guys have been doing the Cup for years and they are pretty good sailors. They’ll do alright, I think. To Alain Gautier. I’d like to ask about Foncia; can you tell us about the capsize and the damage to the boat? Alain: When there was the capsize Ed was the helmsman and I was the skipper of the crew and, when you capsize with a trimaran, with any boat, all the crew is responsible. It was a mistake, when you capsize a boat you have always made a mistake, but that is all part of sailing multihulls. As for Foncia, the composites will be finished at the end of next week. After that we have to fit new electronics and we have a spare mast, so we can maybe sail again at the end of May, or perhaps the beginning of June. To Brad Butterworth. What are the rules concerning the team for a Deed of Gift match; can you hire and fire members at any time? Brad: In a Deed of Gift match you can get anyone you want, at any time. To Ed Baird. Normally, the America’s Cup is about honing your talents to the Nth degree and we saw that in the last Cup. This time it’s back to school and a massive learning curve; which do you prefer? Ed: I think most of the sailors would agree that having close, exciting racing, where you are pushed to be at your very best at every moment, is a lot of excitement and a lot of fun. The America’s Cup is a combination of that sort of sailing and a design contest and the design process is intended to give the sailors a piece of equipment that is superior to the other team. That makes your job a little easier as sailors and Brad and I have always said that when you’re fast you look very smart. We are now in a situation where we are in different boats, substantially different boats, and we have a big challenge in front of us to make sure that we develop the equipment as well as we can. The sailors will always push themselves to be the best they can be and it just depends on how well we can hone our own skills. To Brad Butterworth & Alain Gautier. How dangerous is sailing on a 90 foot multihull? Brad: Very, that’s what I think. It depends on how fast it’s going to go and what the sea state is but, from what I understand and what I’ve seen, these boats are going to be extremely fast and extremely powerful. The loads will be up there, higher than we’ve seen before, and the speeds will be up there, so I don’t think that’s a recipe for being safe. Alain: Multihulls are dangerous; you always have the risk of capsize, everyone knows that. On the 60 foot, last month, we were lucky that we only had two guys injured. Sometimes it can be more dangerous, because you capsize by the bow and you can have 40 metres to do before you arrive in the water, or in the mast, and that is dangerous. It’s a way of life though, you have seen the new circuit for Formula One and that’s dangerous too. Sailing at 35, maybe 38, knots gives you some adrenalin that wasn’t there with the AC boats and this is a new America’s Cup, so you have to live with the new rules. To John Barnitt. Can you tell us a bit about the 1988 mismatch and how it relates to what is happening now? John: We came back from Fremantle which was our world, it was what we understood, and we had a very short time to start sailing our multihulls and that is similar to the situation we have now. We started, in 1988, sailing in little 40 foot catamarans, for an extensive training programme. The difference now is that the mismatch of having a large multihull sailing against a large monohull won’t be the case this time, so it’s a big design programme followed by the execution on the water, so there are some parallels, but in many aspects there are no parallels. To Brad Butterworth. How many crew do you envisage having on the Deed of Gift boat and will Alain be one of them? Brad: These boats will be big, so I can envisage having over 20. Obviously, we still have to select the crew and we’ll be looking for experience and Alain is with us, so he stands as good a chance as anybody. We’ll be going out there with the best multihull sailors we can get. To Brad Butterworth. 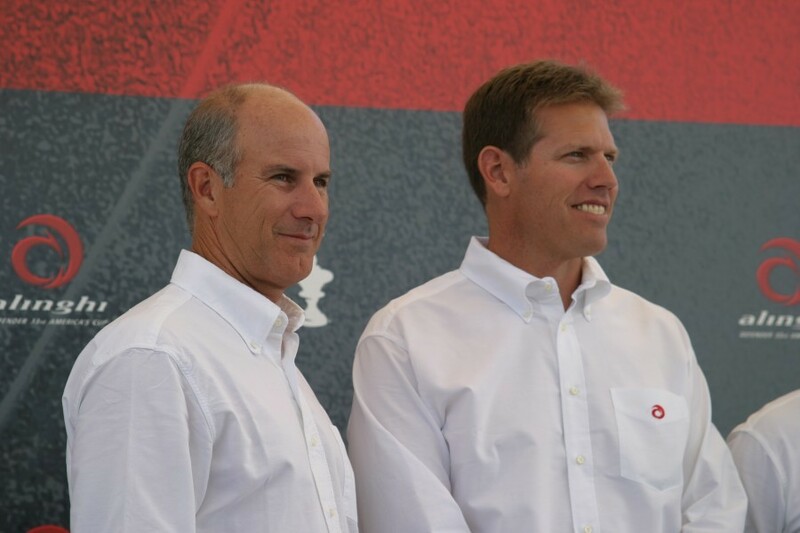 The America’s Cup has become a fight between two men, Ernesto Bertarelli and Larry Ellison. How did you feel in Miami, watching a fight between two other men, Vincenzo Onorato and Joe Fly? Brad: I was glad I was out of it. It was very Italian, by the way, I suppose if there had been too New Zealanders fighting for it, then it would have been very kiwi. Both teams sailed very well; they were above the standard of the rest of the fleet and it looked from the outset that one of them was going to win it. It was disappointing that it came down to a third party protest, deciding the regatta, but that’s the way the sport is, that’s the way the rules are. I think Joe Fly deserved to win the regatta on the water, but Vincenzo was crowned for the third time and that’s a fantastic effort. To Brad Butterworth. We haven’t seen you sailing on these catamarans much and I was wondering if your position with the team is the same as it has always been? Brad: I’ll be sailing today, but I haven’t done much cat stuff. I was hoping to see how things go to start with, I mean maybe they won’t want me, you never know. Not much for a tactician to do on a fast boat, is there? Brad: I agree with you. I think the fastest boat is going to win and there’s going to be a big difference in the speed of the boats and tacking is going to be expensive. I think you’ll see the boats going in different directions at top speed and it is going to be more like a Nascar event. It’s certainly going to be back to the past in some ways. I don’t think anyone can visualise what they will see when these boats get launched. The size of them, the speed of them is going to be something that hasn’t been seen before, because I don’t think there’s been the opportunity for the multihull fraternity to get this much money thrown at it. A yachtsman who has come through the America’s Cup cycle in keel boats knows what goes into it when teams get behind a new rule. Everything gets designed to the Nth degree, everything is custom designed. Could you envisage the America’s Cup taking up multihull racing? Brad: I think it’s up to the guys that own the teams to make that call, but if it was me I don’t know why you’d go back. These boats are not cheap, this is an expensive regatta with just two teams in it and, when you’ve built one of these boats, I don’t see why you’d bother going back to something that’s going to be slower. Sure, everybody loved the multi team event, but it’s not going to happen this time and I don’t think it’ll happen again for a very long time. For Brad Butterworth. 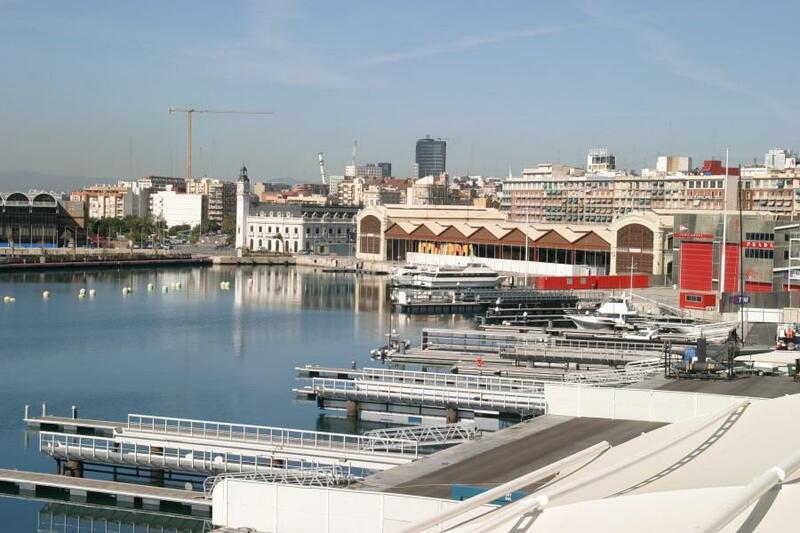 From a sporting perspective, would Valencia be a good venue for this America’s Cup, or should Alinghi take advantage of being able to choose the venue? Brad: I think Valencia is a great venue; it was last time and this time nothing has changed, except that there will be just two teams and it will be in multihulls.